Lovers of classic jazz, and Bob Wilber’s Soprano Summit (co-led with Kenny Davern) and Bechet Legacy groups in particular, will want to run not walk to pick up this two-fer containing over two hours of previously unreleased music from The Bechet Legacy during its 1981 and 1982 British tours. Those familiar with The Bechet Legacy’s On the Road album, recorded in studio with the same personnel while in the midst of the 1981 British tour, will have a very good idea of what to expect, but these 23 live tracks are even more exhilarating and rewarding. Wilber’s ravishing soprano sax and clarinet are joined on the totally-in-sync front line by dynamic trumpeter Glenn Zottola, and they are fervently supported by pianist Mark Shane, guitarist Mike Peters, bassist Len Skeat, and drummer Butch Miles, with Wilber’s wife Joanne “Pug” Horton providing gratifying vocals on several numbers. As one would expect, most of the selections were either composed and/or associated with the great soprano saxophonist and clarinetist Sidney Bechet, with whom Wilber studied, performed, and even lived as a young man in the late ’40’s. Bechet and Louis Armstrong recorded “Down in Honky Tonk Town ” together in 1940, and this up tempo version captures their spirit, with Wilber’s soprano and Zottola’s trumpet evoking their respective idols with aplomb. The other four players solo enthusiastically as well before a typically heated ensemble finale. “Coal Cart Blues” was recorded by Armstrong both with and without Bechet, and this arrangement with the two horns plus rhythm guitar and bass vividly captures the sound of the Bechet-Spanier Big Four, with solo space for all four and soprano and trumpet interacting mellifluously. Bechet’s evocative “Egyptian Fantasy” is sensitively performed by Wilber and Zottola, as they brilliantly inject their own personal touches into the harmonious mix. “Lazy Blues,” an early Bechet composition, is given a deceptively relaxed spin by Zottola and Wilber on clarinet, with the latter’s penetrating, incisive solo, and Zottola’s commanding, exultant statement to follow. Shane enhances the track with his stylish stride improv. “Summertime” was a hit for Bechet, and Wilber brings both his own and Sidney’s personalities to the fore, playing the soprano with less vibrato but no less lyrical flair than his inspiration. Duke Ellington’s “The Mooche,” a favorite of Bechet’s, gets a stirring run-through by Wilber’s resonant clarinet and Zottola’s gutsy plunger-muted trumpet, along with some elegant fills from Peters. Bechet’s lovely, sentimental ballad “Si Tu Vois Ma Mere” finds Wilber’s soprano and Zottola in captivating harmonic allegiance, and the trumpeter delivers a stunningly expressive solo prior to the duo’s unabashedly melodic reprise. The Bechet tune “Dans Le Rue D’Antibes” has a buoyant marching theme and rhythm, and Wilber’s extended soprano flight escalates in intensity as Zottola riffs and Shane strides. Zottola succeeds him in his best jabbing, wailing form, and after the pianist’s prancing improv, the two lead voices hook up for two intertwining, joyful choruses. Also patterned after a Bechet-Spanier Big Four arrangement is “Sweet Lorraine.” Wilber on soprano and Zottola are compelling in their keen lyricism both together and individually, with the latter especially fiery and imaginative. Wilber and Bechet recorded “Polka Dot Stomp” in 1947 and both soprano and trumpet here pounce infectiously on its “Muskrat Ramble”-like changes, as do Peters and Shane in their solos. One luxuriates in the delightful harmonic blend of unison soprano and trumpet on the theme of Bechet’s celebratory “Promenade Aux Champs-Elysees.” Wilber’s solo perfectly combines melodicism with rhythmic vitality, while Zottola follows Armstrong’s example in his highly communicative pronouncement. Shane’s effervescent turn is also a stimulating listen, and Skeat and Miles are given space to entice as well. Bechet’s endearing “Georgia Cabin” is split between soprano and trumpet before Zottola’s majestic solo and Wilber’s more subtly ingratiating one. The wealth of riches on these two glorious CDs also includes superior performances of the standards “Memories of You,” “Oh, Lady Be Good,” and “Just One of Those Things,” in addition to Billy Strayhorn’s “Daydream,” and Ellington’s “I Let a Song Go Out of My Heart,” and “I Got It Bad and that Ain’t Good,” the latter highlighted by Horton’s deep-toned, nuanced reading of the lyrics, not a little remindful of Jack Teagarden’s approach. Every so often a jewel of a recording is unearthed, prompting the obligatory question: “Why not sooner?” This wonderfully energetic, swinging effort is a treasure of an example. 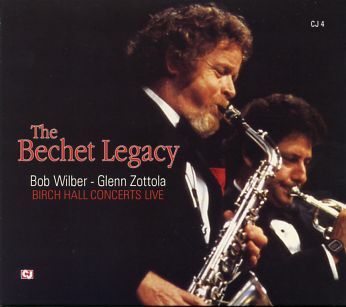 “The Bechet Legacy,” with woodwind artist Bob Wilber and trumpeter Glenn Zottola up front, delivers significant homage toSidney Bechet and to the Golden Era of hot jazz. The double-CD set, recorded live in England over three decades ago, is a home run of Ruthian swing. Somewhat overshadowed by his contemporary, Louis Armstrong‘s own legacy, saxophonist and clarinetist Sidney Bechet played a pivotal role in the development of the art form both here in the U.S. and as a longer-term resident and performer in Europe. His is the robust saxophone root of the tree that would eventually sprout Johnny Hodges(a Bechet student), Coleman Hawkins, and Charlie Parker. Delivering an array of Swing Era standards from Bechet’s and others’ pens, Wilber, (a protégé of Bechet’s) and Zottola soar through the selections with enormous vigor. There’s significant swing across the two session dates where the musical magnificence—and joy—never ceases. Legacy leader, Wilber, of World’s Greatest Jazz Band fame, swings heavy on both soprano and clarinet. His improvised lines burst with chops, innovation and expression. He’s got a gorgeous sound on both axes and is no “vibrato cornball” on either. Partner Zottola, a scion of Zottola trumpet mouthpiece fame, has all of the Armstrong vocabulary in his wheelhouse. He’s got a vibrant sound, chops galore and swings at a level that would send other trumpeters to the woodshed. Like Pops, he uses the upper register shrewdly to fire up his solo forays. These are two stellar musicians performing with the ultimate respect for the tradition at hand. The selections include tunes associated with Bechet, Armstrong, Ellington and others (“China Boy,” “Lady Be Good,” “Memories of You). Supported by a cooking rhythm section of pianist, Mark Shane, drummer Butch Miles, guitarist Mike Peters and bassist, Len Skeat (and a vocal by Mrs. Bob Wilber, Pug Horton), this legacy creates its own. There’s a timeless element to this wonderful music. With so much of today’s jazz over-intellectualized and sterile, Wilber, Zottola and team deliver a vivid, swinging exposure to a timeless musical tradition in a romp. Track Listing: CD-1: Oh, Lady Be Good; Down in Honky Tonk Town; Coal Cart Blues; Egyptian Fantasy; Lazy Blues; Summertime; The Mooche; Daydream; Si Tu Voi Ma Mare; Dans Le Rue D’Antibes; I Keep Calling Your Name; Sweet Lorraine CD-2: I Let A Song Go Out of My Heart; China Boy; I Got It Bad and That Ain’t Good; Just One of Those Things; Polka Dot Stomp; Happiness Is Just A Thing Called Joe; Dear Old Southland; Promenade Aux Champs- Elysees; Georgia Cabin; Memories of You; Swing That Music. Personnel: Bob Wilber: soprano saxophone, clarinet; Glenn Zottola: trumpet; Mark Shane: piano; Mike Peter: guitar, banjo; Len Skeat: bass; Butch Miles: drums; Pug Horton: vocals. One of my guilty pleasures in music is listening to Bob Wilber on either soprano sax or clarinet. Taught by Sidney Bechet, Wilber’s sound and even his look have an old soul on an appeal. His music is always swinging, always happy and always seemingly ignored by the jazz snobs who insist that anything that isn’t cacophonous isn’t really jazz. Here, we’ve got a pair of concerts from the early 80s that have Wilber with honey toned trumpeter Glenn Zottola and a cooking team of Mark Shane/p, Mike Peters/g-banj, Len Skeat/b and, from Count Basie’s Orchestra, Butch Miles on drums. Pug Morton adds lovely vocals on a pair of tunes, but the reason you’re getting this 2 cd set is because you want to remember what horns are supposed to sound like. On clarinet, Wilber is gloriously woody on “The Mooche” and hotter than h e double hockey sticks on “China Boy.” His soprano gives Johnny Hodges a nod on the luscious “Daydream” and rides with Zottola on blazing saddles on the white hot “Just One Of Those Things.” The front horns are febrile on “Oh, Lady Be Good” which also features some cooking soloing by Mike Peters, and the languid “Dans Le Rue D’Antibes, which saunters like a genteel aristocrat. Nothing pretentious here, and like the best cooks in the world, they let the basic ingredients speak for themselves, trusting in the essential good flavors the main products provide. The attitude of the whole pair of gigs and cds is summarized by the title of the last torrid piece: “Swing that Music.” Bon Appetite! The guys who turned me onto old-timey musics were Robert Crumb and Ian Whitcomb. Way back when, while a young, long-haired, troublemaking hippie digging on Crumb’s outrageous underground comix and loving what little I’d heard of Whitcomb (esp. his sole hit You Turn Me On), I figured if these cats were into stuff which previously I’d classed with Lawrence Welk and Old Spice (and they were HEAVILY into it), then I had to be missing something. I was, and, since then, I’ve slowly beefed up on all the elder golden sounds, even to the extent of recently getting hip to Jimmy Sturr and polka. It’s true!, and I have to now watch out for barrels of boiling tar and chicken feathers in venues I still chirographically haunt (the avant-garde, progrock, electronica, etc.) lest I wind up looking like something out of a Saturday Night Live skit…but…it’s worth the risk, and discs like this Bob Wilber / Glenn Zottola twofer show why. This is hipness and then some, babbaloo. Wilber wields a soprano sax and clarinet while Zottola plies trumpet, both in a seven-man little big band bringing back not only the inimitable Sidney Bechet but also Benny Goodman, Charlie Christian, Spike Jones, Tommy Dorsey, Lionel Hampton, and the regal klatsch of over-the-top chopsters and hep cats who used to flat-foot floozy every dance hall and turntable from the Adirondacks to Tierra del Fuego back in the day. The Bechet Legacy: Birch Hall Concerts Live is exactly what it says, a very generous helping of in-concert rhapsodizing over joyously Pleistocenic music for Boomer dinosaurs, their rest-home parents, and even Gen X’ers alight with adventurous spirits. Like the Jazzhaus label over in Germany, Classic Jazz re-presents some great hidden materials to the public at large, and this one from 1981 is as cool as the recently issued Paul Winter Count Me In: 1962-1963 (here) set, though much more mannered in the wont of the era while humorous, decorous, upbeat, and suh-wingin’. Wilber in fact took lessons from Bechet himself and Zottola scored a trifecta playing trumpet on the Ted Mack Amateur Hour as a lad, then toured with not only Jack Teagarden and Buddy Hackett but also Lionel Hampton, Glenn Miller, and Benny Goodman. Christ, I thought I was big time just ’cause I saw Hendrix in concert, but these gents played with cats of equal magnitude well before Jimi ever picked up a guitar! Both gents trot out as huge a treasure chest of chops and improv as would make any modernist jazzbo beam with undiluted pleasure, but the ensemble also, in the old Dixie tradition this work directly stems from and lived within, gets in a wealth of equally slaying shout-outs and squibs, no one neglected, everyone ante-ing up an already considerable kitty. There’s a point at which all great musics meet and shake hands, and I have a lot of trouble convincing devotees of the Grateful Dead, Mahavishnu Orchestra, and Carnatic musics that there’s just as much to revel in with sounds of this ilk, but it’s as true as the day is long, and the proof is right dang here, y’all. Of course, it’s equally tough to convince grandparents of the reverse and that maybe they’d get off just as much on Stevie Ray Vaughn and King Crimson as Ellington and Getz, but, well, who gives a damn anyway? As long as you ‘n me can grin like crazed little monkeys at these flipped-out jams, the sun could go cold for all I care……just so long as there’s enough electricity to keep the CD player going. Listen just to China Boy, and then join me in the cave. Bring some martinis ‘n moonshine.